Each essential vitamin has its own distinct function and benefits. To reap as many of these benefits as possible, you may be thinking of taking multiple types of vitamins at the same time. While this is generally safe, you need to take a few precautions before doing so. Always talk to your doctor if you have any questions or concerns about taking vitamin supplements. Ask your doctor if you even need to take supplements. Many people are able to meet their recommended daily intake of vitamins through their diet, so taking vitamin supplements may not be necessary at all. 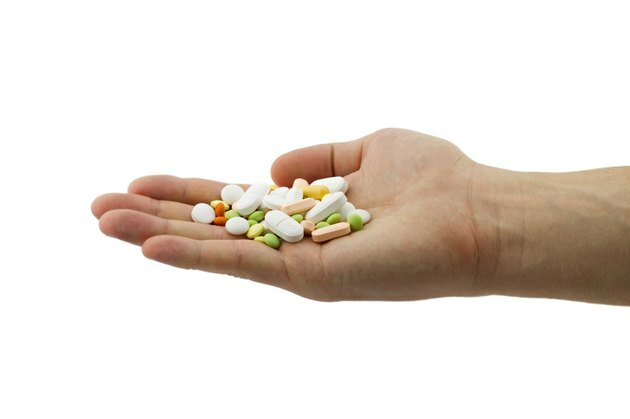 If you do need to take supplements, ask your doctor how much you need. Remember to notify your doctor of any current supplements or medications you are taking to rule out any potential negative interactions with your new vitamin supplements. Purchase your vitamin supplements. Depending on your situation, it may be more convenient to find a supplement that contains all the vitamins you need in one product, such as a multivitamin supplement. Read the vitamin supplement instructions carefully. Make sure you understand the proper way to take each vitamin. Check to make sure that taking the supplement will not put you over the daily limit of the vitamin suggested by your doctor. If you have any questions or concerns about the process, contact your doctor or pharmacist. Take each vitamin according to the instructions on the label, unless your doctor told you to do otherwise. Most vitamin supplements contain similar directions, which typically include swallowing the supplement whole with a glass of water. Check the label of your vitamin supplements to determine if they can be taken at the same time or if they need to be taken at different times of the day. Report any unusual physical reactions to a doctor. While most people will not experience any side effects from vitamin supplements, some will experience a sensitivity or allergic reaction to an ingredient in the supplement. Always direct any questions or concerns to your doctor. If you are already taking a multivitamin, check to make sure taking an additional supplement will not put you over the RDA for any of the vitamins or minerals. You should never take more than one of the same type of vitamin at a time, unless instructed to do so by a doctor. Taking too much of the same kind of vitamin may result in numerous side effects. Symptoms of a vitamin overdose include cloudy urine, frequent urination, eye irritation, cracking lips, increased sensitivity to light, rapid or irregular heartbeat, muscle weakness or pain, joint pain, convulsions, headaches, fatigue, fainting, confusion, mood or mental changes, flushing, itching, sun sensitivity, hair loss, yellow-orange skin, loss of appetite, gastrointestinal issues and weight loss.